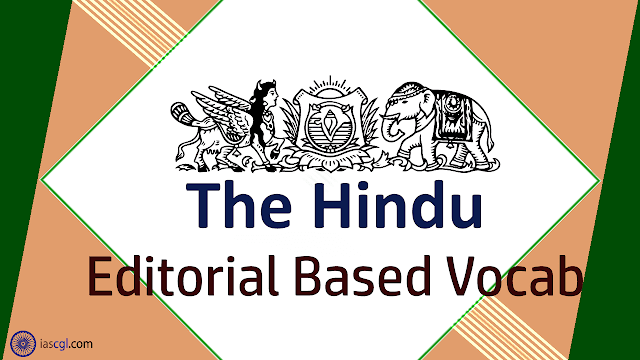 Vocabulary from The Hindu Editorial 04th September 2018 for Staff Selection Commission(SSC) Combined Graduate Level, Combined Higher Secondary Level, Bank PO, Clerk and other state Government Examination. The Law Commission’s consultation paper on reform of family laws is a progressive document that avoids the advocacy of a uniform civil code merely for the sake of uniformity. Instead, it adopts an approach that would facilitate movement towards establishing a article of civil law that promotes equality within the law governing each community. In other words, it advocates the removal of discriminatory provisions in the law relating to aspects such as marriage, divorce, succession and adoption in all religions — and the adoption of certain universal principles that would address gender bias and other forms of existing discrimination. A simple way of moving towards a common marriage law is to make 18 the marriageable age for all communities and genders. When the age of majority and the age of voting, among other indicators of adulthood, stand at 18, there is no reason for differential treatment on this score. The Commission rightly points out that the present age of 21 for men merely affirms the stereotype that the wife should be younger. Decriminalising adultery and making it a common ground for divorce, simplifying the ‘no-fault’ divorce procedure and introducing ‘irretrievable breakdown’ as a ground for dissolving any marriage are other measures it throws open for discussion. The panel suggests abolition of the 30-day notice period for civil marriages to prevent its misuse by those against inter-caste and inter-religious marriages. It also suggests division of property equally after divorce, and removal of illnesses that can be cured or controlled from possible grounds of divorce. The thrust of the Law Commission’s report is founded on the idea that “the mere existence of difference does not imply discrimination, but is indicative of a robust democracy.” Changes have been mooted to give equal treatment to children and parents of any gender in guardianship and adoption matters. The juvenile law principle that the child’s best interest is the ‘paramount consideration’ has also been put forward for universal application. While calling for a wider public debate on its views, the Law Commission has framed the issue in the most reasonable way possible when it says it has “dealt with laws that are discriminatory rather than providing a uniform civil code which is neither necessary nor desirable at this stage.” In a strict and narrow reading, this goes against the Directive Principles of State Policy that favour a uniform civil code; also, some court judgments have questioned why such a code was not yet in place. However, in a world that increasingly heeds cultural diversity, it is unnecessary that every aspect of personal law should be dealt with in exactly the same manner. A just code is one in which universal principles of equality, non-discrimination and avoidance of taboos and social assumptions are applicable in equal measure within every community’s set of laws. Reform: सुधार - the action or process of reforming an institution or practice. Advocacy: वकालत - public support for or recommendation of a particular cause or policy. Stereotype: टकसाली - a widely held but fixed and oversimplified image or idea of a particular type of person or thing. Irretrievable breakdown: अप्रत्याशित टूटना - not able to be retrieved or put right. Thrust: जोर - a sudden or violent lunge with a pointed weapon or a bodily part. Imply: मतलब - strongly suggest the truth or existence of (something not expressly stated). Robust: मजबूत - strong and healthy; vigorous. Taboos: वर्जनाओं - a social or religious custom prohibiting or forbidding discussion of a particular practice or forbidding association with a particular person, place, or thing.